Marking yet another important milestone in Pan Asia Bank’s island wide CSR initiative to improve facilities at identified hospitals, Pan Asia Bank’s Kurunegala branch recently conducted a CSR event at the General Hospital of Wellawa, Kurunegala by supplying furniture to three newly constructed doctors’ consultation rooms which were not being utilised due to lack of required furniture. 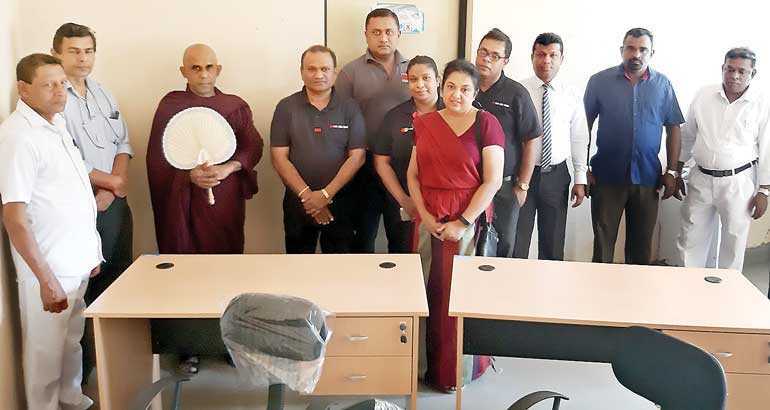 Under this CSR initiative, staff members of Pan Asia bank volunteered to provide necessary furniture items including three tables and three chairs for the use of the doctors, and 12 plastic chairs for the use of the patients in order to help doctors resume their consultations for the patients. This was the last event for year 2018 under this mega CSR initiative by Pan Asia Bank which served more than eight hospitals across the country, namely, Peradeniya – Digana Rehabilitation Hospital, Sirimavo Bandaranaike Children’s Hospital, Nawalapitiya General Hospital, Batticaloa Teaching Hospital, Padalangala District Hospital, Provincial Hospital Kurunegala, Suwamedura Dental Clinic, Horana Base Hospital and the General Hospital of Wellawa, Kurunegala.